So, now we know what to do with an unexplained abnormal respiratory rate in a baby – but how do we know what constitutes an abnormal respiratory rate? That’s the question behind the second paper from a team of Australian researchers which appeared in Archives of Disease in Childhood last month. Click the image below or here to access a PDF of the paper (open access). This is a retrospective, cross-sectional study of infants and children presenting to the ED at the Children’s Hospital at Westmead in Sydney. The aim was to identify normal ranges (age-specific centiles) for heart and respiratory rates in their PED population, then to compare those with previously published normal ranges. Normal ranges by age are currently used to identify pathology in our paediatric patients. We know that the heart rates of newborns are faster than adults, and that the rate during wellness falls as the child gets older. Currently used reference ranges, such as those used and taught on APLS courses, are collated from observational studies as in this paper by Fleming et al (open access). But population measures change: we know from work done at St Emlyn’s that the APLS weight formulae may not be particularly good at estimating the weight of children in the ED which naturally leads us to question other formulae and reference ranges which were historically developed. Back in 2010 I undertook a piece of work for the APLS 5th edition to determine a formula for blood pressure in paediatrics – and I was shocked to find that the evidence for blood pressure centiles in well children is really lacking (so if you find the current APLS blood pressure estimation formula hard to remember – sorry!). It’s good to question what we think we know, and this paper is doing just that. The authors used a retrospective sample of children (0-15 years) presenting to the Emergency Department who were triaged as category 5 (lowest priority). Patients were excluded if they had fever (documented temperature >38deg) or spurious results recorded for heart and respiratory rates and were only included in analysis if both respiratory rate and heart rate were recorded. This left a sample of 111696 unique recordings of heart and respiratory rate paired with the age of the child. The authors then used this data to generate centiles (using quantile regression analyses) with 95% confidence intervals and then compared their findings with those by Fleming et al and Bonafide et al and also against the APLS reference ranges to see whether there was good agreement. You can see the 1st, 50th and 99th centiles for age, compared with the Fleming and Bonafide values, for heart rate here and respiratory rate here. The authors looked at APLS ranges separately and you can see that graph here. It’s worth taking a little time to understand the graphical results because they are not easy to summarise neatly in a single paragraph or two! 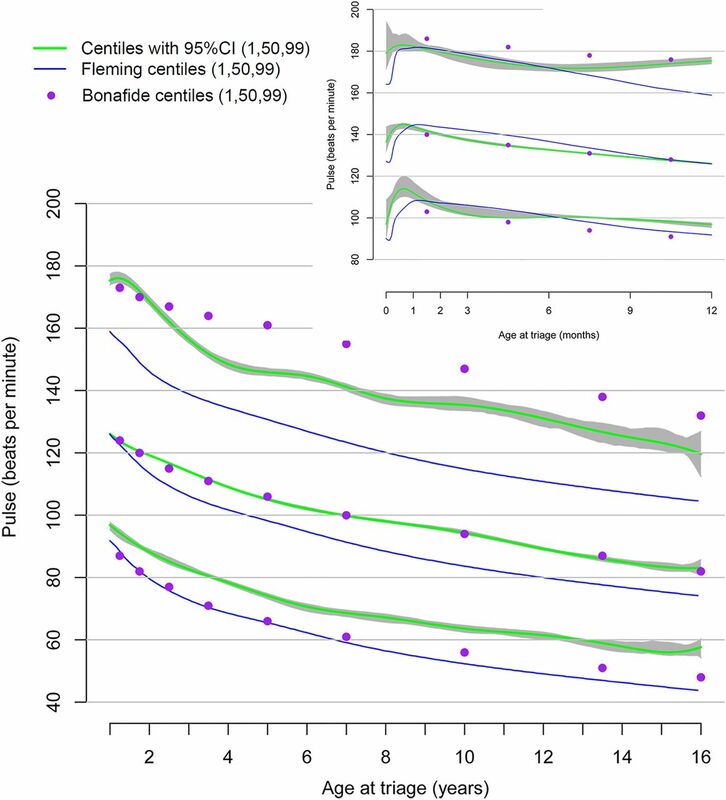 For both heart and respiratory rate, across the age ranges, the difference between 1st and 99th centiles appear wider than Fleming’s data but not as wide as Bonafide, placing these results somewhere in the middle. Both 1st and 99th centiles for heart and respiratory rate in all age groups also lie almost entirely outside the APLS “normal ranges”, casting some doubt about how reliable APLS ranges are. The 50th centile appears a reasonable fit for heart rate against the APLS values but this is not so for respiratory rate. It is worth noting that the age distribution of subjects in the study was uneven: there were more than five times as many patients in the 0-24 months group (summed together) as there were over 12 years of age (40,106 vs 7,393). While this reflects the population we see presenting to the paediatric ED and the authors have achieved a very large data set, we do need to consider how inconsistency in size between subgroups affects the external validity of the study’s data. One of the most interesting findings from my point of view was the “terminal digit preference”; logically, if heart and respiratory rate are counted for a full minute there should be a 50/50 chance of having an odd or even count at the end of the elapsed time. Furthermore, there should be a 10% chance of the rate ending with a “0”, 10% chance of it ending with a “1” and so on. The authors found that this was not the case; 30% of the pulse and respiratory rate readings ended in “0” while 76% of heart rate and 93% of respiratory rate values were even numbers. This leads us to reflect on the reliability of measurements of heart and respiratory rate: are healthcare providers actually counting for a full 60 seconds or are they (and I have definitely been guilty of this!) counting for a shorter period (10/15/20/30 seconds) and multiplying up? This certainly wouldn’t be at odds with previously published literature on the inaccuracy of multiplying up (as mentioned in the first paper on the tachypnoeic baby) and on the inaccuracy of both electronic and clinician-led measurement of respiratory rate. But it looks like even if we measure properly, it’s not completely clear what we should consider as the upper and lower limits of normal. It is important to interpret vital signs in clinical context. The paper raises some uncertainty around the reliability of recorded vital signs and demonstrates that the Holy Grail of Paediatric Emergency Medicine – a surefire way to recognise a sick child early – is still not within our grasp. I don’t think it changes practice but it certainly calls us to critically assess the information in front of us – recorded vital signs, standardised “normal ranges” and the patient we are assessing – before making decisions based on one of these aspects alone. As far as take home messages go, I don’t think that “think critically!” is a bad one. What Can We Take From These Two Papers Together? 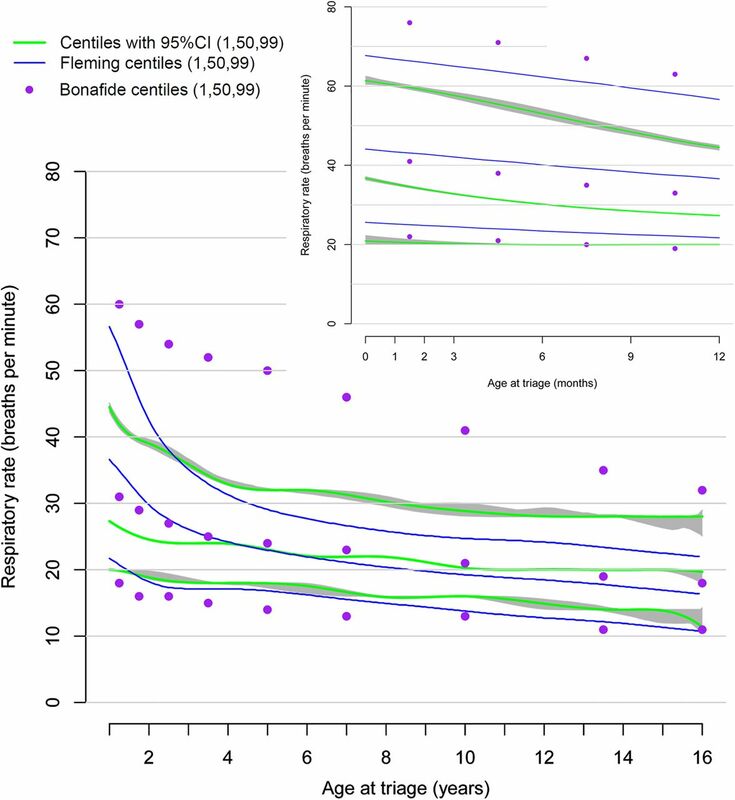 Respiratory rate can be a useful indicator of serious underlying pathology in children however it is still not completely clear what constitutes clinically abnormal heart and respiratory rates. Both can be a useful part of our clinical assessment but we have to ensure that we are recording them both as accurately as possible and interpreting in the light of all available clinical information – with a period of observation or follow-up if uncertainty persists.